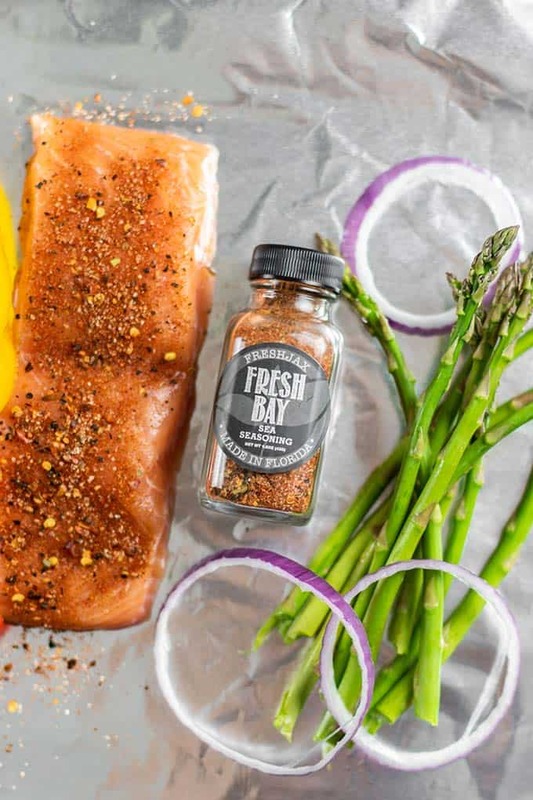 This easy oven baked salmon recipe is the perfect dinner to stay on the healthy eating track this year! I love to make these when I don’t want to cook — takes minutes to put together, and there are no dishes to clean up! 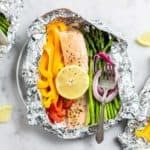 Make this easy salmon foil packets for meal prep! This post is not sponsored by FreshJax. They have sent me spices and I truly love them and use them often to flavor easy meals. I am sharing them here with you because I adore them! Salmon is one of my favorite meals, yet I don’t have a lot of salmon recipes because the way I prepare it is super simple. It needs very little work to make a delicious salmon dinner. I rarely do anything but bake my salmon in foil packets. It keeps the fillets super moist, and it’s a hands-off preparation. 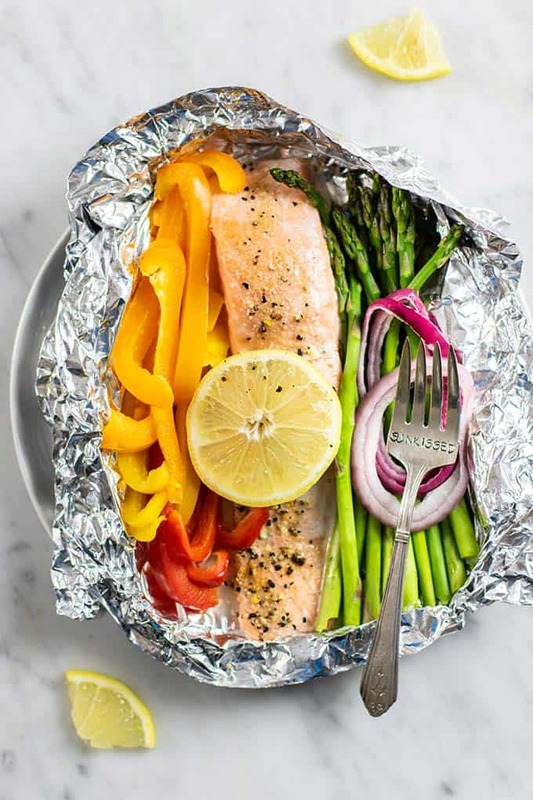 Simply chop up a few veggies, season the salmon, and wrap it all up in foil. 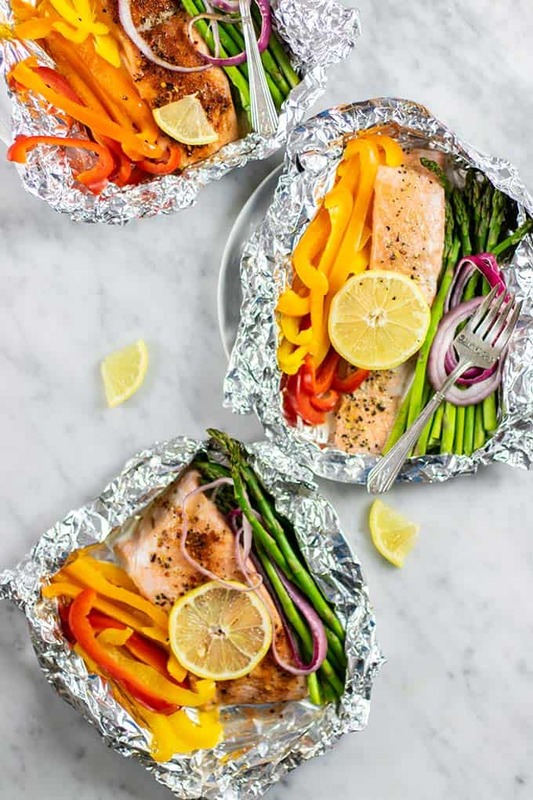 My favorite veggies to wrap up in salmon foil packs are peppers, asparagus, onions, and mushrooms. I top it off with a few lemon slices for a delicious sweet pop of citrus. There is no reason to get super fancy with these or make sauces to compliment them. Some simple seasonings is all they need! 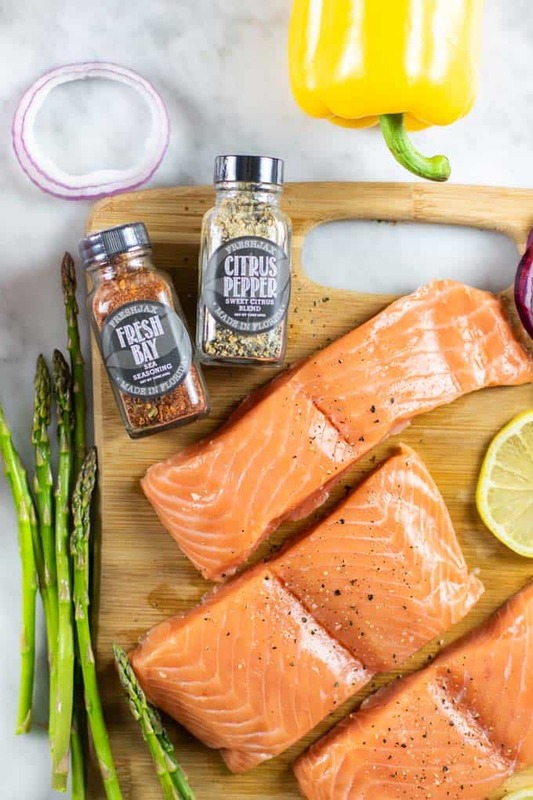 I have started using several of the FreshJax spice mixes on salmon. The ingredients are amazing – organic spices and herbs, sometimes some lemon peel, a couple of the blends have organic brown sugar. They are ingredients I would use on my own, but in unique and flavorful combos. I adore using the Habanero, the Fresh Bay, and the Citrus Pepper on salmon. 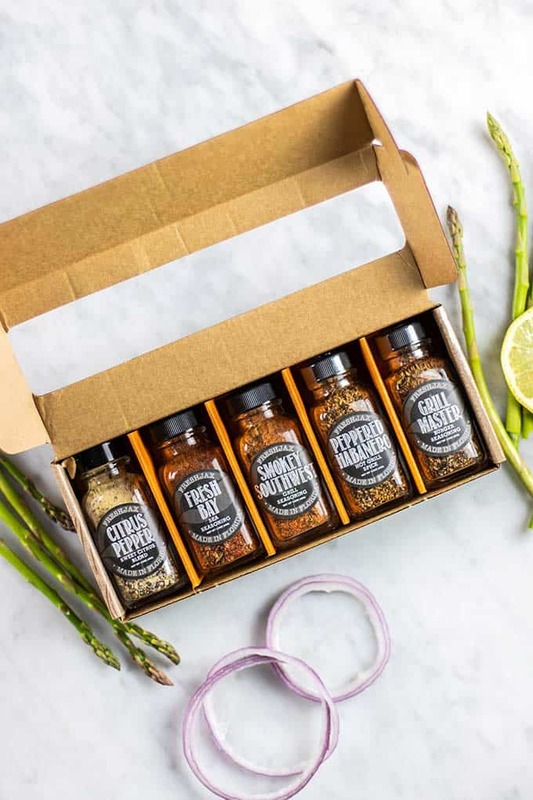 These are all in their Grilling Spices gift set – – which is one sale right now! You can also purchase on Amazon. Salt & pepper — generously! How Long Do you Cook Salmon in the Oven at 400º? 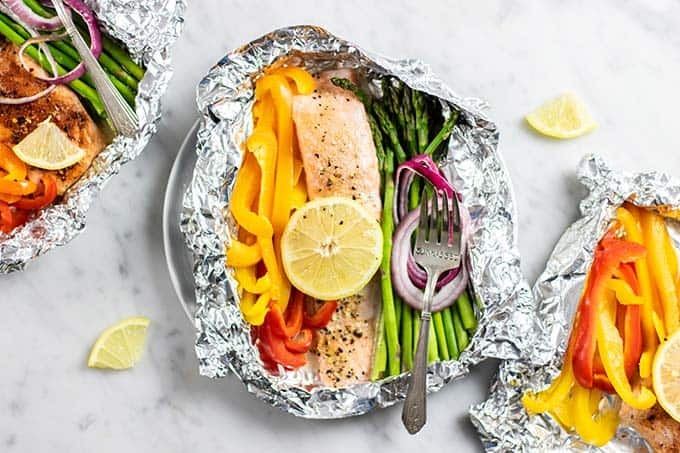 How long you need to bake these foil packets depend on how you like your salmon (medium or well done? ), and the veggies you add to them. If you’re baking the salmon on it’s own without veggies, the salmon will be baked medium in about 18 minutes. If you’re adding veggies that bake quickly, similar to what I have in these packets, it will take about 22 minutes. If you’re added more starchy veggies, like chopped butternut squash, potatoes or sweet potatoes, plan on these taking about 28 minutes. If you’re baking the salmon on it’s own, plan on these taking 25 minutes to be well done. If you’re baking the salmon with veggies that bake quickly, similar to what I have in these packets, it will take about 28 minutes. If you add starchier veggies, like potatoes or squash, these could take up to 35 minutes. An easy and healthy dinner for any day of the week! We love this dinner because it's super simple, super clean, and leaves to dishes to clean up. Customize with whatever veggies you have on hand! Preheat oven to 400º Farenheit. 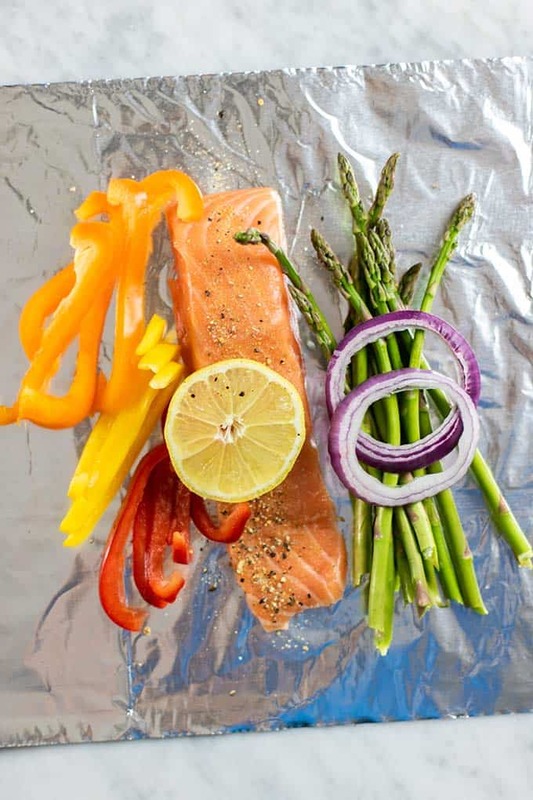 Lay out a large piece of foil. Add a fillet of salmon in the center, and surround with chopped veggies. Season to taste with your choice of seasonings, and top with a couple lemon slices. 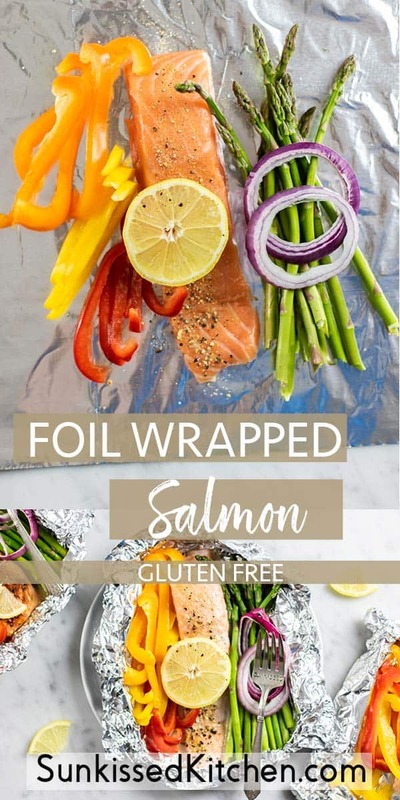 Wrap the foil packets by folding in the top and the bottom edges, and then wrapping the left and the right into the center. Add foil packets to a large cookie sheet to catch any juices that might be released. Bake for about 20 minutes for medium well salmon, and 25 minutes for more well done salmon. Read instructions above if you're baking only salmon, or salmon with other vegetables. This Easy Oven Baked Salmon Recipe post contains affiliate links, meaning if you make a purchase, I will receive part of the sale as a commission. This helps me continue to bring you lots of fresh and inspired recipes!